Sustainable transport campaigners have voiced concern after the Welsh Government said it will consider allowing HGVs to use bus lanes in the country to ease traffic flow. The move follows a suggestion from the country’s traffic commissioner, who regulates both HGVs and buses, which was taken up by the Welsh Assembly’s Economy, Infrastructure and Skills Committee. A Welsh Government spokesperson said: ‘The committee wrote to the cabinet secretary for economy and transport, Ken Skates, who agreed to review the potential for allowing HGVs to use bus lanes in Wales in limited circumstances. The Freight Transport Association said it was ‘delighted’ to hear that the Welsh Government was seriously considering the idea. 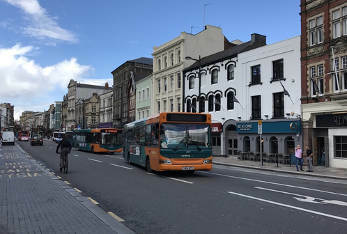 In his annual report, traffic commissioner Nick Jones noted that ‘there have been instances across Great Britain where the introduction of bus lanes has had the effect of a negative public reaction with a degree of hostility’ and pointed out that in some parts of the country (outside Wales) local authorities have allowed HGVs to use bus lanes ‘where the roads are planned so that this is facilitated’. He stressed that he was not suggesting that lorries should use all bus lanes but said that ‘each case should be considered on its merits and that there might be occasions when allowing HGVs to use a bus lane will improve traffic flow’.